ENABLE, an extension of the Carolina Health Informatics Program (CHIP), was established to encourage students and professionals from diverse backgrounds to explore careers or advanced training in Biomedical and Health Informatics (BMHI). The Director of the Carolina Health Informatics Program came to Visible Logic when they needed a logo for their ENABLE program. He wanted something that paid a “visual nod” to the MIT logo, the leaders of this area of study. Visible Logic worked to design a logo that incorporated UNC’s required corporate color palette while looking like the distinct and leading-edge program that it is. 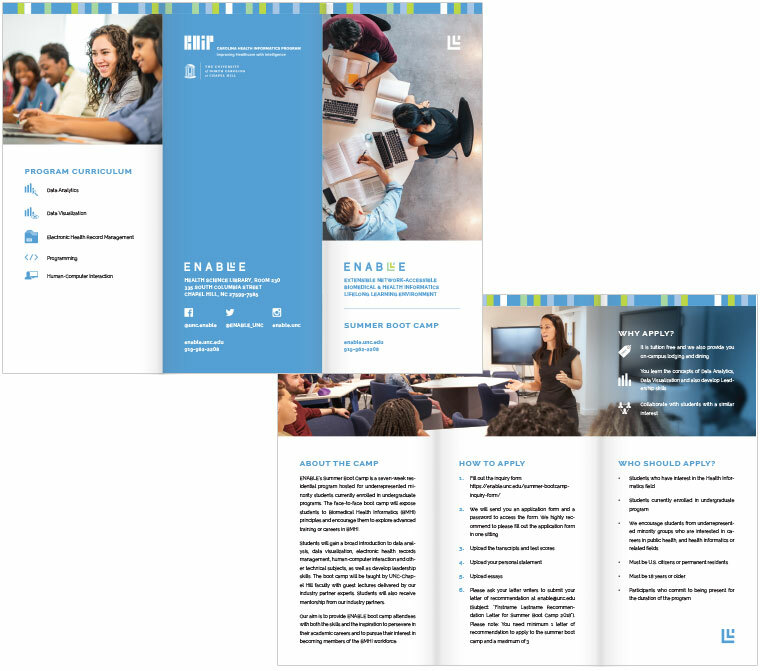 After the logo was complete, we worked to create a trifold brochure to share information about the program.